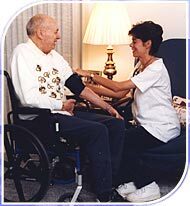 Located in Raleigh, North Carolina, Agape Healthcare Services is among the leading provider of home health care, medical staffing and group home facility services. We pride ourselves in providing exceptional service to our clients and we offer our employees a safe environment to work in, as well as ongoing career training. Our services are gear to every sector of the healthcare industry as well as the individuals. We welcome the opportunity to help you, a member of your family, and/or your patients. Please take a moment to visit our site and experience the difference we can make for you or your clients.